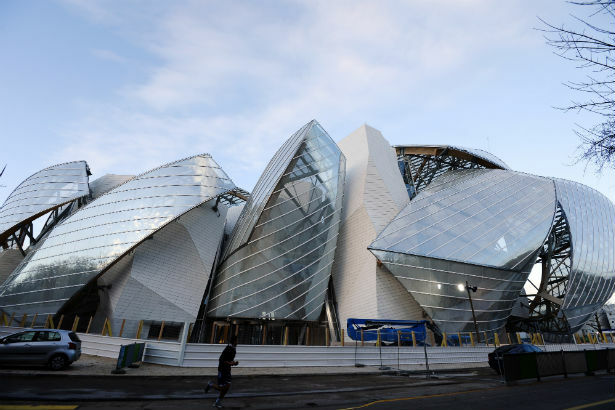 The much-awaited Louis Vuitton Foundation, a new museum just outside Paris in Bois de Boulogne, is set to open its doors on October 27. The 126,000-square-foot building designed by Canadian architect Frank Ghery (who was recently tapped for Louis Vuitton's 'Icons and Iconoclasts' project) will house LVMH's corporate art collection, with space for 11 galleries and an auditorium for events and special performances. The building, which cost about $136 million to build, is supposed to resemble a glass cloud. The Foundation is a testament to the luxury conglomerate's financial success over the years, though officially, the institute's purpose is to "encourage and promote contemporary artistic creation both in France and internationally,” rather than showcase the glory of LVMH. LVMH CEO Bernard Arnault has been very involved, telling WWD that “this a small payback to the public, and to our employees." The very first exhibition will be quite close to the building's history: it is to be devoted to Ghery's architectural contribution to the Foundation. You'll be able to catch it for free at the institue for the first three days after its opening, as LVMH is inviting the public to reserve complimentary tickets to the museum. “[The Foundation] will express the artistic, cultural and emotional values, as well as the art of living, promoted by Bernard Arnault and the LVMH Group," said LVMH advisor Jean-Paul Claverie. "But it is truly a charitable foundation, devoted to the public as a whole,” he notes. How might a multi million-dollar glass building you'll have to pay to get into be a gift to the public? Claverie says that LVMH has only a 55-year lease on the building, essentially making it a gift to Paris.